Throughout the years, Julie has entertained countless millions with her beautifully choreographed routine, touching her fans with her special blend of skill, artistry, music, humor and patriotism with every performance! Julie has always and continues to directly interact with her fans after each performance. She answers questions, poses for pictures and signs autographs until the last one leaves. It is remarkable, that Julie is still flying the same, beautifully restored Beechcraft T-34 Mentor… an unparalleled accomplishment. 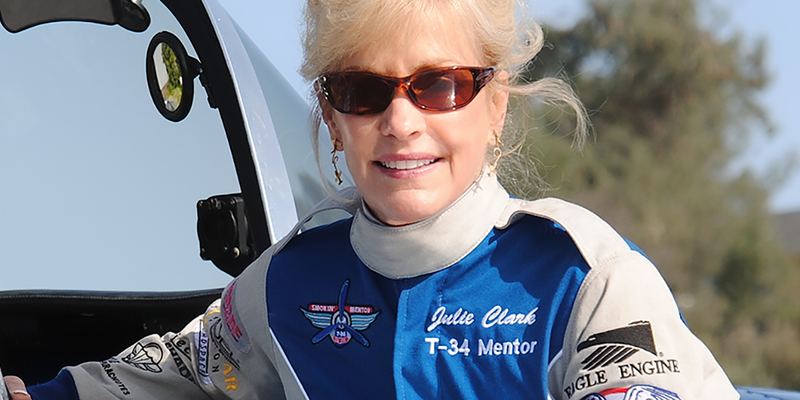 During her air show career, Julie maintained a record, nineteen-year association with Mopar, five years with Chevron Global Aviation, two years with Juice Plus+ and currently entering her fourth year with the Tempest Aerogroup. It is important to note that 2019 also marks Julie’s 50th year, flying. A retired Northwest Airlines Captain, Julie has now flown more than 34,000 accident-free hours. This, amazing accomplishment, has been made possible because of Julie’s commitment to safety, high standards and professionalism! In recognition of her achievements, Julie has received more than 40 individual awards from her peers, fans, government and industry. Among them are; the Crystal Eagle, the Art Scholl and Bill Barber showmanship awards and she has been inducted in the Women in Aviation, Pioneer Hall of Fame, the ICAS Foundation Air Show Hall of Fame and the Minnesota Aviation Hall of Fame.